Back in March Vimal contacted our team to enquire about our photo booth services. On a very cold and snowy day I met with both Vimal & Keerti at our office in Shepshed to discuss their wedding day plans and the different photo booth packages we are able to offer. During our meeting we discussed the timings that were already in place, the colour photo booth they were interested in hiring, along with the finer details such as the curtain in the photo booth, print design and guest book options. Vimal and Keerti left our Jackstar office that day with most of the details already in place, all that was left was to finalise the booking with the booking contract! Ahead of Keerti & Vimal’s wedding day we sent over a proof of the print design for them to see. The couple went for our ‘movie strip’ design and incorporated the green that was in Keerti’s sari. We also finalised the timings, positioning of the photo booth, contact numbers for the day and spoke with the venue to ensure they had everything they might need from us. You can never have too many props … Right?! What a difference four months can make! From the snowy cold weather when we met, to mid heat wave in the UK! Another beautiful summer’s day for Keerti and Vimal’s wedding. At around 5.30pm I arrived at the Shree Prajapati Hall to unload and begin setting up our photo booth. The rest of the room was all set, having been transformed from ceremony to evening reception with tables, chairs, DJ & decor. With the photo booth starting at 6.30pm I did my final test shot at 6.15pm. I was ready to go! Keerti and Vimal’s guests began arriving a the venue and it didn’t take long for people to begin using the photo booth! 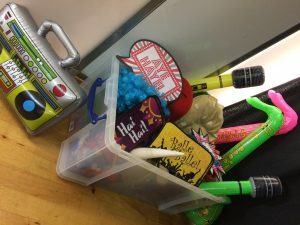 Dressing up with our large props box which contains over 30 different props for guests to choose from. Once finished inside the booth, it then printed two copies (in less than 20 seconds!) of each print. One copy was for guests to take away and the other was for the guest book. Along with assisting people with using the photo booth I ensured that a copy of every print was stuck into the couple’s guest book and encouraged everyone to leave a message to wish them well. Before I left that day I ensured that Keerti and Vimal had a go in the photo booth together. Having heard so many times before that the couples themselves didn’t get a go in the photo booth as it was so busy, this is always a must for us. Vimal & Keerti in the Photo Booth! Efficient, amazing communication and friendly staff is what defines Jackstar – they made our reception scrap book look amazing with loads of photo booth photos from friends and family. Thank you Louise and Eliza for all the great work and due diligence throughout.